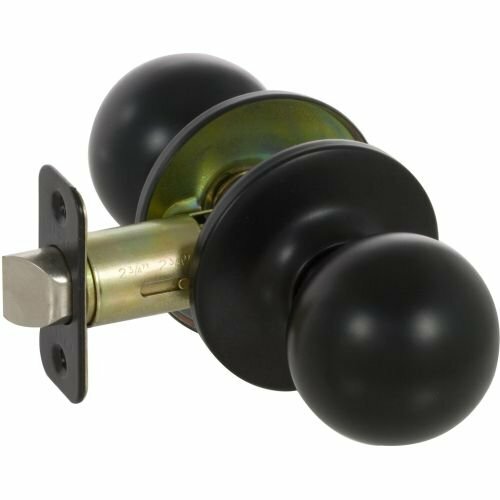 KR1014 Finish: Black Features: -Fairfield Passage Door Knob incorporates old world quality with new age design. The round silhouette adds style and value to any home and complements a wide range of interior designs.. -ANSI grade 3 certified. Knob Function: -Passage. Knob Shape: -Ball. Style: -Contemporary. Door Type: -Exterior/Interior. Dimensions: Overall Height - Top to Bottom: -2.63". Overall Width - Side to Side: -2.62". Overall Depth - Front to Back: -2.87". Overall Product Weight: -1.1 lbs. Combination Screws that Suit both Wood or Metal Door Mounting. Works Well with Both Classic and Functional Decor. Projection from the door - 2-7/8 in. Dimension - 2-5/8 L x 2-5/8 W x 2-5/8 H in. If you have any questions about this product by Callan, contact us by completing and submitting the form below. If you are looking for a specif part number, please include it with your message.